A typical day in California's Napa Valley. Photo by Katie Harbath via Flickr. Six wine-related events crammed into two days? Count us in! The Wine Festival of Colorado Springs—the premier wine event of the Front Range—is entering its 21st year, hosted in partnership with The Broadmoor and the Garden of the Gods Club. Last year's theme was Spanish Wines, and this year the focus will shift far west to Napa Valley, California. Here's a quick FAQ about Napa and wine, but please feel free to submit any more questions you have in the comments section! Why is Napa so good for wine grapes growing? Despite being over 5,000 miles away from the Mediterranean, Napa Valley has a unique Mediterranean geography and climate due to its proximity to two mountain ranges (the Mayacamas Mountain Range and Vaca Mountains) and San Pablo Bay. The valley itself is 30-miles long, stretching in a northwesterly direction, and ranges from one to five miles wide. Because it is close to water, there isn't a huge change in temperature between night and day—producing slightly cooler nights. How long has Napa been famous for its wines? 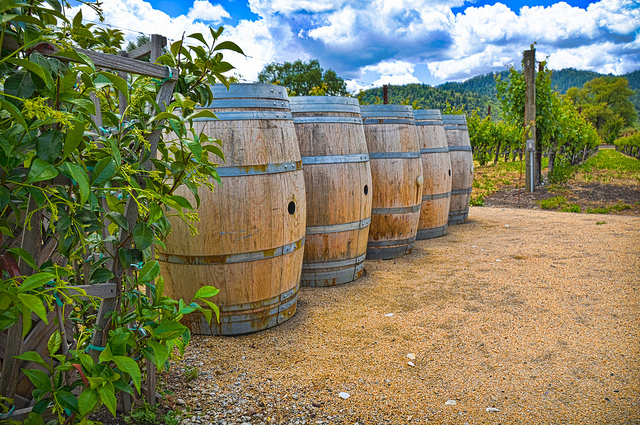 Napa exploded onto the wine scene in the 60s when regional premium wine production skyrocketed. Although early settler George C. Yount planted wine grapes at the turn of the 19th century, technological innovation in fermentation and other techniques did not occur until the mid-20th century. The Paris Wine Tasting of 1976 held a blind taste test of wines from France and Napa. Napa's Chardonnay and Cabernet Sauvignon beat out all these French wines, establishing the region from then on. What's the difference between the main red wines? Cabernet Sauvignon - world's most recognized red, heavy and intense. Dark purple/ruby color. Merlot - less tannin (stuff that makes you pucker) than Cab Sauv, hints of berry, plum and currant. Pinot Noir - considered one of finest wines in world (difficult to grow AND ferment), results in regional taste variations. What's the difference between the main white wines? Sauvignon Blanc - known for lightness and crispness, taste ranges from grassy to tropical. Colorado Spring's best date night! Come join this sell-out event, featuring over 300 wines plus culinary delights from many of our region's finest restaurants and caterers. Place your bids at the silent Wine Market auction and dance the night away. Tickets. The culmination of the Festival is the Gourmet Wine Dinner and Live Auction. The evening begins with a five-course gourmet dinner, each course paired with the elegant wines of our distinguished guests, and concludes with the region’s premier live auction of rare collectible wine and wine-related lifestyle packages. Tickets. These are wait listed events, check the status with the Box Office at 719.634.5583. Here are longer event descriptions. Fri, Mar 9, 5:30 p.m.
Join winemakers from from four different Napa wineries, VGS Chateau Potelle, Keenan Winery, Bouchaine Vineyard, Robert Sinskey Winery, to taste and discuss their wines. Sommelier James Hayes will host this seminar to contrast wines from pre-1997 to their current releases. Napa Wine, But What Cheese? Sat, Mar 10, 10:30 a.m.
Winemakers and fromagère (cheese expert) put their heads and products together to make the tastiest pairing for any of your own parties. Sat, Mar 10, 12:30 p.m. This chef as worked in Michelin-rated restaurants and is one of the industry's most lauded tastemakers. She'll pair her food with wines from VGS Chateau Potelle, Robert Sinskey Winery and Chateau Montelena.